ACC-6043A / FTLX1441E2 SPIRENT – FINISAR X2 Transponder 10BASE-LR 1310nm SMF used in good, working condition for US $395.00 with a 90 Day Hardware Warranty! ACC-6043A SPIRENT – FINISAR X2 TRANSPONDER 10BASE-LR 1310nm SMF. ACC-6043A / FTLX1441E2 SPIRENT – FINISAR X2 Transponder 10BASE-LR 1310nm SMFfor sale at Northwest Remarketing. This entry was posted in Spirent and tagged 10Base-LR, 1310nm, ACC-6043A, Finisar, FTLX1441E2, northwest remarketing, nwrusa.com, SMF, Spirent, Transponder on May 29, 2014 by nwrusa. 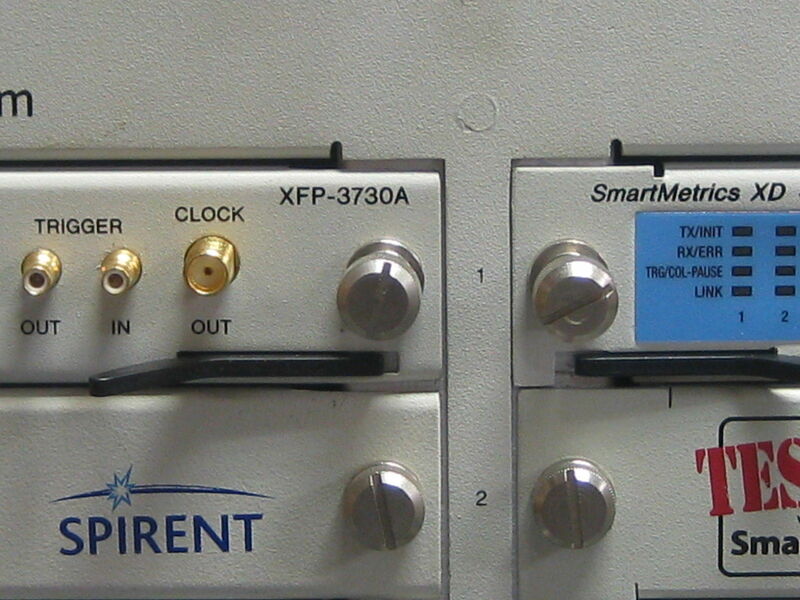 Spirent Smartbits SMB6000C XFP-3730A 10G XFP LAN-3324A Smartmetrics for US $18995.00 with a 90 Day Warranty. If you have any questions about this equipment please feel free to call me @ 503.391.8191 x 114 . I am available to answer your questions 8-5 PST. Free Shiping If You Elect To Buy It Now! SmartBits 6000C (SMB-6000C) chassis is the industry’s highest-port-density network performance analysis test system. Each chassis can support up to 12 slots of a wide variety of test modules to suit port density and technology needs. 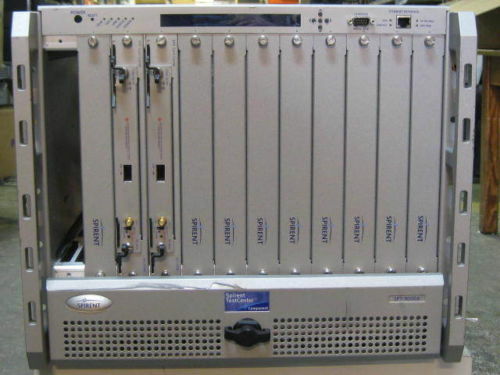 SmartBits 6000Cs can be interconnected to achieve ultra high-port density, enabling users to perform auto-mated large scale testing in Quality Control and high-volume production environments. 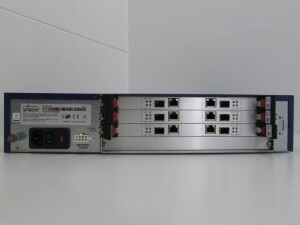 Up to 8 chassis can be synchronously connected together using a simple cable; this can be extended up to 512 chassis using SmartBits multi-chassis extension units. 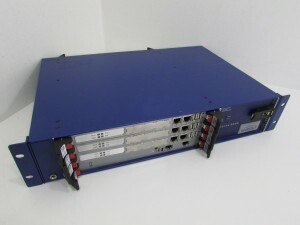 The SMB-6000C is easily controlled by a host computer through a 10/100 Mbps Ethernet connection and uses a Windows®, Linux, or Solaris-based interface. 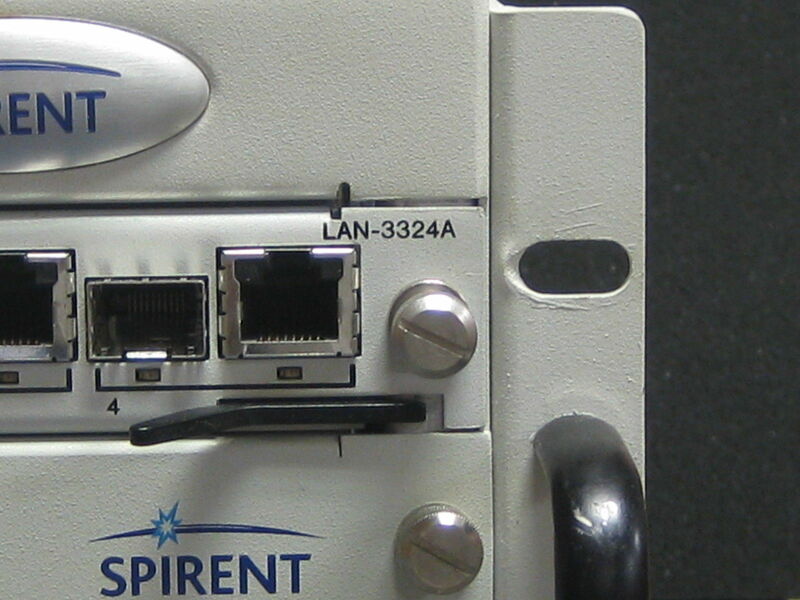 The Spirent SmartBits XFP-3730A is SmartMetrics™ and TeraMetrics™ 10 Gigabit Ethernet (10GbE) XFP-MSA-based test modules used to measure the performance and test the interoperability of networking devices. TeraMetrics modules feature a dedicated Pentium™ processor that provides integrated and highly scalable control and date plane performance testing. TeraMetrics enables you to test applications from Layer 2 to 7. SmartMetrics provides a complete suite of Layer 2 and Layer 3 test capabilities at a lower cost per port than the TeraMetrics version. Each module complies with the IEEE 802.3ae standard specification. The Spirent SmartBits LAN-3324A TeraMetrics XD modules offer Dual Media Ethernet connections on every test port. The user can select a 10/100/1000 Mbps connection or a Gigabit Ethernet Fiber connection on each port. Each XD module can simulate the millions of clients and servers necessary to fully stress test a device or network. 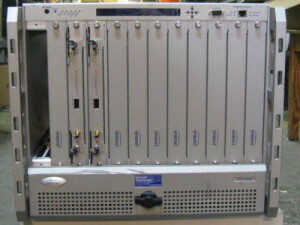 The SmartBits test system can scale from 2 ports up to 768 test ports. 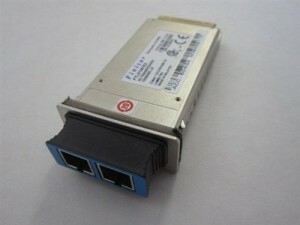 Requires SFP Transceiver for Gigabit Ethernet Fiber testing, order ACC-6025A for Multimode (850 nm) or ACC-6026A for Singlemode (1310 nm). Spirent Smartbits SMB6000C XFP-3730A 10GXFP LAN-3324A Bundle for Sale at Northwest Remarketing. This entry was posted in Spirent and tagged 10GXFP, bundle, CDMA, chassis, Ethernet, fiber, Fibre channel, GPS, LAN-3324A, Linux, MSA, MSA Module, northwest remarketing, NTP, nwrusa.com, Pentium, performance analysis system, slot, Smartbits, SmartMetrics, SMB6000C, Solaris, Spirent, stress testing, TeraMetrics, testing, transceiver, Windows, XD Module, XFP-3730A on May 15, 2014 by nwrusa. Spirent Testcenter SPT-9000A 2x XFP-1001A 10G XFP Bundle for US $17995.00 with a 90 Day Warranty and Free Shipping. If you have any questions about this equipment please feel free to call me @ 877.650.4041 . I am available to answer your questions 8-5 (pacific time zone). Free Shipping If You Elect To Buy It Now! 3 power supplies – Inlet AC requirement 3 120V/15A (5175W AC nominal) circuits, output DC power of power supply is 1200W per power supply or 2400W total. Note: Three power supplies required for 14 or more UniPHY or WAN ports. - Redundant power supply option: hot swappable third power supply. Note: Power redundancy is module configuration dependent. - Weight: 110 lbs. (49.8 kg) fully loaded. - Operating environment: 59° to 104° F (15° to 35° C); 20 to 80% relative humidity. 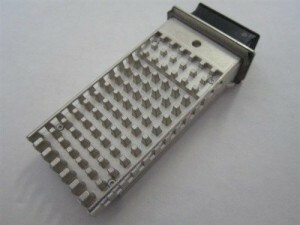 Must have 6-inch space for unimpeded airflow into the chassis fans, and out of the chassis vents. Must also have blank panels installed for all empty slots. - Connectors: Two DB9 serial console (one on the front and one on the back, only one can be active); RJ-45 Expansion In/Out connectors for multiple chassis connection; RJ-45 BITS clock connector; connectors to attach to an external GPS or CDMA receiver. 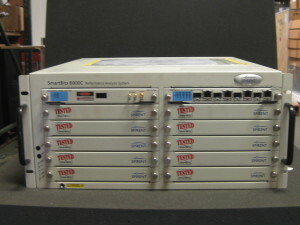 Spirent Testcenter SPT-9000A 2x XFP-1001A 10G XFP Bundle for Sale at Northwest Remarketing. 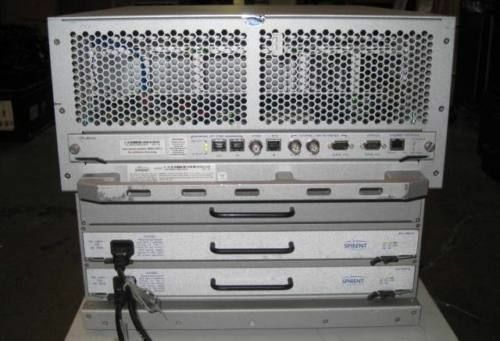 This entry was posted in Spirent and tagged 10G, 2x, adapter, AMP, bundle, capacity, card, carrier, chassis, configuration, Ethernet, inlet AC, module, northwest remarketing, nwrusa.com, orientation, port, power supplies, redundant, security, slot, Spirent, SPT-9000A, Testcenter, WAN, XFP, XFP-1001A on May 15, 2014 by nwrusa.